How To Include Webinars In Your Customer Lifecycle? Your content strategy should be adapted to your customer lifecycle. Take an in-depth look at how to include webinars into this strategy. Better content improves your sales cycle and help you grow your business. Just before I start, note that this post has been inspired by the amazing medium article from Myk Pono. Quick reminder, a customer lifecycle is a six stages funnel in which the customer has to go through in order to become a loyal customer. Vistor: Basically someone who lands on your website. Prospect: A prospect is a visitor who has converted (demo, trial, download…). Somehow, they have expressed interest in what you are offering. Activated user: When you deliver value for the first time to your prospects, they become activated user. They got their fist aha-moment. Customer: This one is easy. As soon as they pay for your product, they become customers. Active customer: Once your customer uses your product on a regular basis, he or she becomes an active customer. Loyal customer: When a customer renews, upgrades, or pay for more features. Again, check Myk post for more details on each stage. Why is this relevant for my content strategy? Your content strategy should incorporate this approach of customer segmentation. When you educate about your product and address your customer/prospect concerns, you improve the demand and your sales funnel. Awareness: Get people interested in your main topic. Then, how do I include webinars in my content strategy? Hopefully, webinars are versatile. You can cover all those items just by doing webinars. The positive aspect of that is that you will create high quality, re-purposable content (more on that later) and generate business at the same time. Here are a few examples of how I would use webinars for each items above. Description: Short interviews, or live FAQs with an industry expert. If you are a CRM solution, then invite a VP of Sales from another company (maybe even a customer). Talk about their process, some achievements, or best practices. Objective: Offer a CTA at the end. Make them download a document (e.g slides). Define if the attendee is a prospect. Description: Let’s continue with our CRM solution example. Do 45 minutes sessions in which you will address your audience concerns about CRMs and sales problematics. Educate about how you as a company address those. Having a happy customer as a guest is big plus. Objective: Push to signup and/or pay for your product. Description: Now it’s time to sell. This is where you unleash your product demos. Get your sales team and/or any team member that would be relevant (e.g PM or engineer if you are a tech product). 45-60 minutes divided in 2 parts: demos + Q&A. Description: You closed some customers? Great. Now it’s time to get your customer success team to onboard everyone. Do in-depth sessions about your main features, review some specific use cases, and share your next milestones. Finish with some Q&A sessions. You can also offer 1:1s sessions for customers who need help. Objective: Prevent churn and/or deliver aha-moments. Here you go. Hope you guys find it useful. 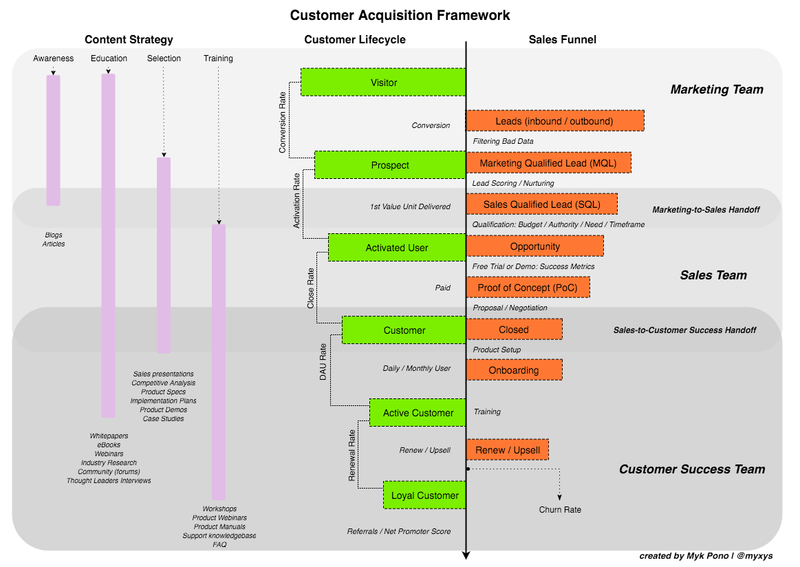 Remember the key is to provide value to customers at each stage of their lifecycle. Tell us how you implemented webinars in your own strategy. Feedback is more than welcome.